Claver’s life changed dramatically at the age of 13. An orphan who spent most of his life living in an orphanage, newly adopted Claver was transitioning into a traditional family structure for the first time. And this transition, his new parents realized, was going to be a process. Developmentally, Claver had been delayed from years of being institutionalized in the orphanage. Issues in school arose because he had never learned how to interact with authority figures or other children. He also had trouble trusting his new parents. But Claver’s new family wasn’t about to give up on him. Claver’s new father, Bernard, knew with constant care, attention, and support Claver could flourish, it would just take a little time. Volunteers from the local church paid regular visits to Bernard, to encourage and train his large and loving adoptive family. They connected the family to sponsorship to help cover new expenses and school fees. Claver is now 15 years old and thriving thanks to the strong relationships he developed with his parents and siblings. He is also doing much better in school. Bernard proudly passes around Claver’s latest report card - boasting that he is now fourth in his class! Claver's healing will be an on going process. The relational pain he experienced while living in the orphanage will require care and attention from a family who knows and loves him. His rescue from the orphanage made possible thanks to the support of the local church and the generosity of Saddleback sponsors, who give Bernard and his family the support they needed to bring Claver home. When Amerita learned from her local church that there were children in her community who needed loving families, she took a step of faith and made the courageous decision to adopt 13-year-old Felix from the orphanage. 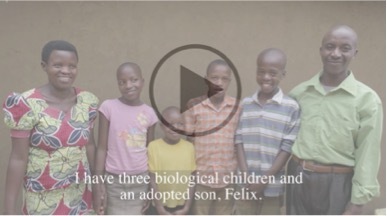 One year later, Felix now enjoys life as a much-loved son and spends his days playing with his three siblings - Claude (also age 13), Diane (10), and Fifi (8). Amerita is excited to share via video all she has been able to do to care for her growing family through the generosity of her local church and Orphan Care Sponsorship. WATCH THIS VIDEO to hear how sponsorship has impacted her family and her ability to care for her new son. Orphan Care PEACE Teams have been helping raise up adoptive families and train lay social workers in Rwanda all summer! You and your family can go to Rwanda to be apart of the amazing transformation God is doing – email orphans@saddleback.comfor more information. Two new churches in Kigali, Rwanda’s capital city, have taken an important first step in receiving training on God’s Heart for the Orphan and starting Orphan Care ministries. 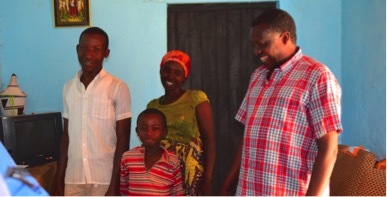 To begin sponsoring a family like Amerita's, visit Saddleback.com/Sponsorship. As the distribution center for hope in the community, the local church is uniquely positioned to intervene on behalf of the orphan. In Saddleback’s Rwanda Orphan Sponsorship program, the local church in Rwanda determines which families will receive sponsorship and is responsible for providing families with volunteer social worker support. The partnership between Saddleback Sponsors and the local church is changing lives-getting children out of orphanages and into lifelong families! This month, check out a sponsorship update filmed by local Rwandan church volunteers highlighting the difference the program is making. (The children) were very young when they first came, and they were 4 and 6 years old. They were very happy. They called me their mom and they were very comfortable. I made sure they went to school. One is in primary 5 and the other one in primary 6. The Church and the Pastor started to come to visit the children. I didn’t even know the pastor, but I believe that it’s God who sent him to us. We were blessed by what God was doing through the support from the church. When the support came from the church, I bought a cow so that it could help the children and built two more rooms in my home. I tell the children to always praise God and thank him because he’s the one who did this for us. We thank God for the support and very grateful for the church. We thank God for the church, they visit us very often. And we always go to church to praise and thank God. We no longer live a lonely life; we live a peaceful and happy life. To learn more or become a Sponsor, visit www.saddleback.com/sponsorship. Great opportunities to serve in Orphan Care this month! There are so many exciting ways to get connect to serving in the Orphan Care Initiative. Check out the events and teams below for ways that you can take your next daring faith step to serve orphans and vulnerable children locally or globally! Daring Faith Expo - Serve at the Orphan Care Booth! On the weekend of May 16/17, each Saddleback campus will have the opportunity to learn how to join the Orphan Care Initiative during the Daring Faith Expo at every service - and we need your smiling face to help people get connected! If you are interested in serving at the Orphan Care booth for just 30 minutes after any service(s), let us know and we will get you all the information you need! Thinking About Adoption or Foster Care? Have you considered adopting or fostering, but aren't sure how to get started? Every first Wednesday of the month from 6:30-8:30pm in MO2, families from our church who have adopted and fostered share helpful overviews and answer your questions in a no-pressure environment. If that time doesn't work for you, we'd still love to talk to you. Free to call or meet with us for more information on fostering and adopting! You can brighten the day of a child living in Orangewood group home, OC's temporary shelter for children who have been removed from their homes due to abuse or neglect. The first group will be visiting the evening of May 22nd. This is a great opportunity for those looking to care for vulnerable children right here in Orange County. Email orphans@saddleback.com for more information. Orphan Care PEACE trips train local churches in promoting adoption, assisting newly adoptive families, and training lay social workers within churches. We'll train you in everything you need to know, and help you or your family make a difference in ways you've always dreamed! Let us know when you would like to go, and we will get you connected to a trip leader. To join an upcoming trip email orphans@saddleback.com. Court Appointed Special Advocates (CASAs) mentor children in the foster system and act as their voice in the legal system. With a commitment of 2 hours twice a month, you can help represent the best interests of a child and support them on their journey to a lasting family of their own. If you would like to learn more about becoming a CASA in Orange County, please visit their website http://www.casaoc.org/advocate/ to RSVP to the next info session, or email orphans@saddleback.com for more information. Join a local or global action team! You can serve in ways too numerous to name, but here's a sample: Serve orphans and vulnerable children in our neighborhoods, help teach local churches in orphan care, or come alongside adoptive or foster families. Serve in sponsorship, social media, website development, writing, hospitality/event hosts, or advocacy. There's a place for you! This season's Adoptive and Foster Family Support Group meets on Tuesdays from 11am to 1pm in room 409/411 on the Lake Forest Saddleback Church campus. The support group will be studying from the DVD curriculum The Connection written by Dr. Karyn Purvis and Elizabeth Styffe. Unfortunately, no childcare is available. Please RSVP by email to orphans@saddleback.com. Interested? Just let us know and we will find the exact spot for you, your family or your small group. We'll help get you connected and provide any necessary training. Have questions? Need more information? Connect with us by email (orphans@saddleback.com) or phone (949-609-8555)! We can't wait to serve with you soon! Did you know that for $38 a month, you can change a child’s life? Saddleback’s Rwanda Orphan Sponsorship program provides hope for children in orphanages by sponsoring families who need a bit of financial support to bring a child into their home. When orphans gain a family they become permanent sons and daughters. Hi I’m Kay Warren. I’d like to tell you about a new kind of child sponsorship. Children need the love of a family, which is why we’re working in Rwanda to help them empty all their orphanages and place those children into permanent caring families. Of the 3000 children in orphanages, 1200 now have families to call their own. There’s still more to be done. You can help empty orphanages by sponsoring a family in Rwanda, helping a child reunite with or regain a family. Sponsorship helps a family provide school feels, food, clothes, and health insurance for the child. You can learn more at saddleback.com/sponsorship. When you sponsor you are helping an orphan become a son or a daughter again. To begin sponsoring a family in Rwanda visit saddleback.com/sponsorship. Thank you.